More than 150 years before Michelangelo and Leonardo da Vinci called Florence home, her citizens faced a moral dilemma. They were blessed with unprecedented prosperity brought about by advances in industry and agriculture and a prolific lending economy, yet many feared that their new wealth might jeopardize their admittance to heaven. They relied on their faith to help them navigate a path between affluence and piety and they looked to art to guide their devotion. Fortunes were invested in building new churches and in adorning their walls and altars with art that assuaged the Florentine conscience. Florence’s unbridled faith in art to address and express its hopes, fears, anxieties and desires provided its artists the unprecedented freedom to experiment with new ways of picturing a fast-changing world. 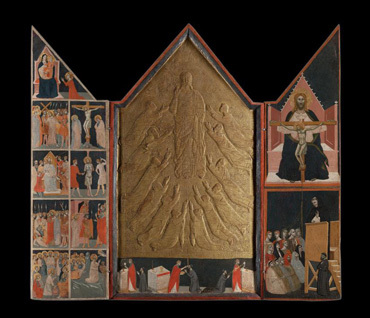 Giotto di Bondone (c. 1266–1337) responded by revolutionizing representation in painting through the introduction of human scale and perspective, and Pacino di Bonaguida (1302–1340) redefined the rules of storytelling in both manuscript and panel painting. Sheathed in gold leaf, the monumental Peruzzi Altarpiece is an ethereal vision of artistic progress. Giotto moves away from the iconic stoicism of altarpieces past by turning each figure toward Christ in a relatable fashion. 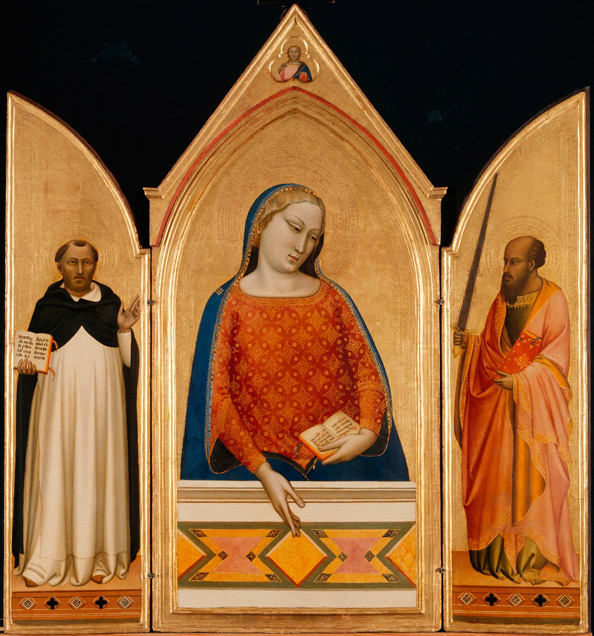 The same innovative approach is present in the work of Giotto’s follower Bernardo Daddi, whose pristine triptych The Virgin Mary with Saints Aquinas and Paul depicts the Virgin’s hand as it extends beyond the sacred pictorial space and into that of the viewer’s. Pacino di Bonaguida’s manuscript dedicated to The Appeal of Prato to Robert of Anjou follows in a similar vein, so that the turning of the book’s pages truly brings its figures to life. In the early 1300s, the population of Florence relied on its artists to make its ideal world real through imagery that conflated the earthly and the ethereal. This exhibition inspired us to consider the weight of such a major civic commitment to art and to revel in the limitless potential of human creativity. The Early Renaissance is considered one of the most crucial and dynamic periods in Western art history. Wealthy 14th-century citizens commissioned extravagant works covered with gold leaf and crushed gemstones. For the first time in history, artists attempted to portray real people and local buildings in their scenes. Giotto was the first Renaissance artist to attempt to make people and space look three dimensional. Because people wanted to see themselves in the art, contemporary hairstyles and fashion were depicted (or portrayed). Artists worked in workshops in order to produce the volume and scale of artworks that were ordered. Workshops were bustling hives of activity compared to modern-day solitary artist studios. Every workshop had a leader: the master artist. The master artist would often paint the important parts of the painting, while his assistants would aid in the detail work or the secondary imagery in a large painting. More than 90 rare masterworks have travelled to the AGO from over 40 international lenders. Besides paintings and stained glass, this exhibition includes manuscripts that have never before left Florence. Counting on art to express their hopes, fears, emotions and ideals, a newly prosperous merchant class in Florence commissioned new buildings and decorated them with art of all kinds. The artists of Florence established workshops to meet this increased demand and to train the next generation. During the Renaissance, Christians used paintings and manuscripts to aid in prayer and devotion. Devotional artworks took many forms — frescoes, stained glass, panel paintings, altarpieces, large-scale and small-scale crucifixes, manuscripts and sculpture. The Laudario of Sant’Agnese, illuminated by Pacino di Bonaguida and the Master of the Dominican Effigies, was taken apart in the early 1800s and has been reunited in this exhibition for the first time since then. The book’s illustrations combine scenes from Christ’s life together with images of saints. Learn more about the Laudario. As an interest in storytelling grew, people wanted to relate their fast-changing world to that of their saviour. Narratives about the lives of the saints, and in particular the life of Christ, emphasized their human nature. This new focus prompted artists to closely observe the world around them and to work toward increased naturalism. For the first time, artists included local people and recognizable architectural details in their scenes. Many artistic workshops opened in Florence during the 1300s and were led by a master painter or craftsman. The master of the workshop was aided by a number of assistants or apprentices who, in turn, were trained to eventually become independent painters themselves. They made instruction books to pass on the various techniques such as panel painting, fresco, mosaic, burnishing with gold, casting and painting on parchment.